All-new, more powerful, more fuel-efficient, more luxurious. The Acura MDX is all-new for 2007. It’s larger then the previous model and has been improved in every area. That’s saying something given that the first-generation MDX (2001-2006) had a unique combination of style, design, utility, and a rock-solid powertrain with both good power and good fuel economy that made it very popular among mid-size luxury SUVs. It sold in record numbers right to the end and was the second-best-selling Acura model (after the TL sports sedan). The all-new 2007 Acura MDX is built on a proper truck platform, and is not an adaptation of the Accord passenger car platform. It doesn’t look larger than last year’s MDX, but it is in fact several inches longer and wider. That makes it among the largest vehicles of its type. It offers more space for folks and flotsam inside, totaling almost 143 cubic feet. From its wild new grille to its elaborately stylish cat’s-eye headlamps to its huge new taillamps, it’s got a more muscular look compared to the original, especially in the areas around the tires. Sporty styling cues include the big, fat dual exhaust tips that look like they belong on a V8, and the hefty five-spoke alloy wheels. Even the Acura badge in the grille has been changed, and is now twice as big as it once was. The seats are laid out in three rows of two, offering seating for up to seven people. The 10-way driver and 8-way front passenger power seats allow huge adjustment latitude for long-distance comfort. The new MDX is physically stronger than the previous model, with a more rigid structure that’s much more resistant to twisting and bending, beneficial for ride and handling as well as tightness as the vehicle ages. Powertrain improvements include a larger, more powerful V6 engine, combined with a five-speed manual-shift automatic transmission. The completely updated exterior appearance, which is sportier still than the original, will make it easy to spot the new one. Inside, there is a completely new approach to SUV interior design, a more organic, unified presentation of instruments and controls, a more involving scheme for the driver that should be appreciated by moms and dads alike. We found the MDX quiet and quick, with nicely weighted steering. The active damper system that comes on the Sport model makes driving the MDX more fun, with a flatter ride and less body roll in the corners. The driver can select between sport and comfort modes for sharper handling or a softer ride. The navigation system, satellite radio, iPod input jack and Bluetooth phone synching make it easy and fun to go down the road. Acura says the new MDX competes with the BMW X5, the Volvo XC90, the Lexus RX 330, the Mercedes-Benz ML350, as well as the Cadillac Escalade and GMC Yukon Denali. Acura hopes the new MDX will appeal to women who want a sports car but need an SUV. The 2007 Acura MDX ($39,995) offers three major options packages, two of which are positioned as models. With the Technology package ($43,495), the MDX gets Acura’s wonderful voice-activated navigation system, this time out with Zagat reviews and ratings embedded, a rearview camera, AcuraLink satellite communications with real-time traffic data, a 410-watt ELS surround sound system with 6CD changer and 10 speakers, wireless telephone equipment, and three-zone automatic air conditioning. The Sport package ($45,595) includes the Techology package and adds Delphi active-damping magnetic rheological shock absorbers, perforated leather interior trim, alloy wheels, and self-leveling HID headlamps. The Entertainment package ($2,200), available with either the Technology or Sport packages, adds a DVD rear entertainment system, heated second-row seats, a power tailgate, and a 110-volt power point in the front console. Safety equipment on the new MDX is as complete a package as there is in the industry. The front bucket seats each have two-stage air bags and active head restraints, two-stage driver and front passenger knee bolsters, front seat side air bags and three-row side-curtain air bags including rollover triggering. That’s in addition to the mandated front airbags. Active safety features, designed to help the driver avoid accidents in the first place, include all-wheel-drive, electronic stability control, and anti-lock brakes (ABS) with electronic brake force distribution and brake assist for panic stops. The 2007 Acura MDX exterior and interior were designed entirely in America, at Honda’s facilities in Los Angeles and Ohio, with input from design centers in St. Moritz, Switzerland, and Milan, Italy. It’s supposed to look like a Wally 118 motor yacht, but it still looks like an SUV to us. The formerly tasty grille has been turned into a metal-filled hole that looks like a battering ram, and the entire side has been rearranged with a new side window arrangement that suggests more sportiness than the original, with converging sheetmetal lines built into the design. Both headlamps and taillamps are heavily sculpted, and there is not one ounce of plastic cladding or side trim, in the same design vein as the original. Very clean, but susceptible to parking lot slams and door dings. The wheel openings, especially the fronts, are very pronounced, for a more sporty stance. Overall, we’d give it an 8.7 for exterior design, remembering that it’s essentially a big cargo box on wheels. This second-generation MDX is more than two inches longer in length and wheelbase than the previous model, with a wider track and a lower stance. The MDX is now larger than its competitors. Acura’s first power tailgate system is available on the MDX with the entertainment package. It can be operated either from the remote key fob, from a button on the driver’s door panel, or from a button located inside the tailgate. The location of the tailgate’s motor is the D pillar, not the roof, which yields more headroom for the third-row occupants. The tailgate can also be operated manually. The Acura MDX has a completely new interior decor for 2007. It’s designed with driver-centric instrumentation and displays. Acura calls this area “mission headquarters.” The beautiful new three-spoke brushed-aluminum steering wheel alone has nine control systems mounted on it for cruise control, telephone, entertainment systems, and information displays. The new dashboard has a high-mounted large navigation screen in the heavily sculpted panel, with all other switches subservient to the big nav center, and carefully orchestrated into about one square foot of dashboard real estate. The two-line readout display for the climate control and entertainment systems uses large segmented figures and is very easy to read and interpret. The compact main instrument pod is housed in one deeply tunneled nacelle, with four even deeper nacelles for the main instruments. If you look at them long enough, they appear to be staring back at you, with bright white-on-black markings and red needles tracking your progress. The seating is arranged as two front, two center, and two rear, with a third seat available in the second row. There is scant rear legroom in the third row for adults; the third row is strictly for kids. In spatial terms, the interior has 142.2 cubic feet of passenger space. There’s 15 cubic feet of cargo behind the third seat, 43 cubic feet with the third row seats folded into the floor, and 83.5 cubic feet with all seats down. Translation: The MDX is competitive in the class. The new Acura MDX offers a quiet ride and brisk acceleration performance. With the five-speed automatic, the MDX is rated to tow up to 5000 pounds. The 2007 Acura MDX benefits from a completely new platform, suspension, and unit-construction body with a built-in frame and subframes front and rear. The MDX is really stout, some 15 percent stronger in torsional bending and seven percent stronger in lateral bending. This time out, it has 56 percent of its body in high-strength steel as opposed to the original MDX’s 13-percent HSLA steel content. It’s longer and wider, with a 2.5-inch longer wheelbase and similar gain in overall length. All that adds up to a quieter ride quality, with zero squeaks, creaks, groans or rattles. The 300-hp 3.7-liter V6 engine is all-new for this application. Compared to the old 3.5-liter, it has been treated to a hot-rod upgrade, with a bigger bore, bigger stroke, higher compression (11:1, necessitating the use of premium unleaded fuel), and a higher redline (maximum rpm). It makes 47 more horsepower and 25 additional pound-feet of torque compared to the old engine. Acura says it’s the most powerful V6 engine in any SUV sold in the U.S. market. It’s quick, fast, and quiet, like every Acura engine before it, only more so. One very significant development has come underneath the lithe lines of the MDX, and that’s the active damper system in the Sport package option. These are the fastest-acting shock absorbers in the world, used by Cadillac, Ferrari, Corvette, and Audi, and they make driving an SUV much more sporty, with a flatter ride and less body roll in the corners. A console-mounted switch lets the driver select between sport and comfort modes with the shocks. With the additional power and torque available from the new engine, and the amazing capabilities of the Acura Super Handling All-Wheel-Drive (SH-AWD) system already on board, we wouldn’t order an MDX without this new technology. We drove the MDX in the hill country of western Pennsylvania and eastern West Virginia, and found it to be a delightful traveling partner. The torque-sensing variable power rack-and-pinion steering provided the right amount of help in every situation from parking to very high speed Interstate travel, with nice weight at the wheel and good center behavior. The wheel was connected to big 255/55R18 mud-and-snow tires, very nice to have along, not too noisy, with plenty of cornering grip. Braking performance in those hills was exemplary. The Acura MDX is all-new for 2007. It’s larger now, and sized right for the job. It’s aggressively sporty-looking, it’s powerful and its suspension was developed on the Nurburgring, so the sportiness is really there. The interior design is especially zoomy, but not at the expense of function and ease of use. They’ve nailed it, again. good it alone is almost enough to justify buying the car, all the switches and controls operate with precision, the engine operates with utter serenity but still manages to have an engaging character, the suspension is well-controlled without being brutal and there’s enough room in the trunk to hold the lighting section of a good-size Home Depot. The 2007 Acura TL is not a car without limitations, but for many buyers they’re the sort of limitations that don’t really matter. The 2007 Acura TL is a midsize entry-level luxury sport sedan. There are two trim levels: base TL and Type-S. The base TL comes well equipped with a moonroof, heated side-view mirrors, automatic headlights, leather upholstery, power and heated front seats, dual-zone climate control, HomeLink and full power accessories. The astounding ELS Surround Premium eight-speaker sound system with DVD audio capability is also standard. The sole option is Acura’s satellite-based navigation system that integrates both a rearview camera and voice-recognition ability with the “AcuraLink” real-time traffic-reporting system. The TL Type-S receives a more powerful engine, a sport-tuned suspension, performance tires and more powerful brakes. The navigation system is standard, the interior is trimmed with aluminum and fake carbon fiber instead of fake wood, special sport seats promise more lateral support, the LED instrumentation glows red and blue and the pedals are finished in aluminum. On the outside the front fascia has a deeper front airdam, the side skirts are more pronounced, there’s a deck lid spoiler, the taillights glow with LED brilliance, there are four exhaust outlets and the special 17-inch wheels, front grille and other trim all feature a dark matte finish. Base TL sedans have a 258-hp 3.2-liter V6 under their hood, lashed to a five-speed automatic transmission with sequential manual shifting that drives the front wheels. The TL Type-S has a 286-hp 3.5-liter version of the same V6 hooked to either a six-speed manual transaxle and limited-slip differential or the five-speed automatic with paddle shifters for manual operation. The driver side and passenger dual-stage, dual-threshold airbags are supplemented by side airbags for the driver side and front passenger and side curtain airbags for both front and rear passengers. A Vehicle Stability Assist (VSA) program helps keep the car upright while antilock and electronic brakeforce distribution systems ensure the four discs aboard stop the car. The 2007 Acura TL gets the top five-star rating from NHTSA for frontal impact and side impact safety. The IIHS rated the TL “Good” (the best rating possible) for protection in frontal-offset crashes and gave it a “Best Pick” designation after its front-offset crash tests. Among its peers, the TL luxury sport sedan has one of the best interiors with an elegant design, excellent material quality and nicely shaped seats. The cockpit has a stylish two-tone color scheme, aluminum inlays and an attractive set of bright blue electroluminescent gauges. There’s plenty of room for a pair of adults to ride in back, and the trunk holds 12.5 cubic feet of cargo. Both the TL and TL Type-S receive suspension revisions for 2007. Collectively, the effect is a crisper and more controlled car without the harshness usually associated with sport tuning. We’ve driven all its competitors and the TL is definitely the smoothest operator on all types of pavement. The Type-S is just slightly edgier but still within the acceptable range. However, dedicated driving enthusiasts will likely be a little disappointed with the front-drive layout, as it prevents the car from being as fun to drive as other sport sedans like the BMW 3 Series and Infiniti G35. After a three-year absence, the performance-oriented “Type-S” trim level returns. It features a 286-horsepower, 3.5-liter version of Acura’s SOHC 32-valve VTEC-equipped V6, a sport-tuned suspension and Brembo high-performance front and rear disc brakes. The Type-S also gets a unique front fascia, quad tailpipes, specific 17-inch wheels and paddle shifters for the five-speed automatic transmission when that option is ordered. The regular TL continues forward with freshened exterior styling and a revised center stack and instrument panel. However the six-speed manual transmission and Brembo brakes are now restricted solely to the Type-S model. Roomy and well-appointed interior, excellent handling for a relatively large front-drive sedan, sweet-natured V6 engines matched to outstanding transmissions, fantastic sound system, top crash-test scores. The market for near-luxury cars has changed dramatically in the last several years, and the Acura TL shows us the way in which personalized performance has become more important than restrained luxury. 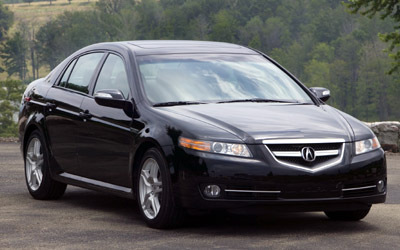 The front-wheel-drive Acura TL combines dramatic style, a powerful V6 engine, a responsive chassis. Just as important, the TL offers an extensive complement of the latest electronic features, making the driving experience more entertaining and more enjoyable as well as faster and safer. Since its introduction in 2004, the current-generation TL has led Acura toward a bolder, more aggressive identity. For 2007, the Acura TL receives a useful makeover that features styling changes and upgraded mechanical details, plus more electronic features. Most important, there are now two models, the standard TL and the performance-oriented TL Type-S.
As before, the standard TL features a 258-hp 3.2-liter V6 engine. For 2007, it has been re-tuned to deliver a relaxing balance of comfort, driving enjoyment and practical luxury. Meanwhile, the TL Type-S has a 286-hp 3.5-liter V6, and it’s a hard-edged sports sedan, with unique styling and an aggressive personality more in keeping with the TL’s original mission statement. As popular-priced sedans have become quieter, more comfortable, and more spacious, premium near-luxury sedans have changed their focus, and they now emphasize style and driving enjoyment. The Acura TL’s evolution over the last decade into a sports sedan reflects this trend. But in keeping with its Honda-bred heritage, the Acura TL is also about being modern and efficient. As a consequence, the lightweight, front-wheel-drive TL is refreshingly different from the heavy, rear-wheel-drive sedans found elsewhere in the near-luxury category. The Acura TL is a mid-size, front-wheel-drive, four-door sedan powered by a V6 engine. Two models are available, the TL ($33,624) and the TL Type-S ($38,125), distinguished by engine performance, suspension tuning, and convenience features. The TL comes with a 258 hp 3.2-liter V6 with a five-speed automatic transmission that has a manual-shifting feature with a console-mounted lever. The TL Type-S features a 286-hp 3.5-liter V6 with a five-speed automatic that has shift paddles on the steering wheel. The S-type R is available with a six-speed manual transmission, and it’s matched with a limited-slip differential for improved traction. Leather upholstery comes as standard equipment on both the TL and the TL Type-S, along with an eight-way, power-adjustable seat for the driver, a four-way power-adjustable seat for the front-seat passenger, dual-zone air-conditioning, power door locks, and a power moonroof are also standard, a 225-watt, eight-speaker sound system with a six-disc CD, DVD-Audio with Acura’s own ELS 5.1 surround sound, cassette tape player, and XM satellite-ready AM/FM radio. Additional audio features for 2007 include WMA- and MP3-compatible playback, Dolby Pro Logic II, and automatic, speed-sensitive volume control. In addition, a hands-free, wireless, cellular telephone system employing Bluetooth technology is built right into the TL. ensing Climate Control, a unique feature of the ventilation system that correlates the position of the sun with the car’s direction of travel in order to automatically balance temperature control on either side of the car. High-performance summer tires are optional ($200). Safety features include dual front airbags, front-seat side-impact airbags (for torso protection), and curtain-type head-protection airbags. Sophisticated electronic sensors help modulate airbag deployment depending on the weight and position of the front-seat passengers. Active safety features include electronic stability control, traction control, antilock brakes, and electronic brake-force distribution. A monitoring system for tire pressure is also standard. The Acura TL has a dramatic creased-and-folded look, almost as if it had been extruded from some amazing high-tech machine. Designed in the U.S., it has nothing in common with the soporific, soap-like shapes that you might remember from Japanese-brand near-luxury cars of the past. It’s signature is a beveled front fascia matched with a wide, impressive stance, and there’s an attention-grabbing gutter at the beltline. For all this visual aggression, the TL’s bodywork has a surprisingly sleek coefficient of aerodynamic drag at 0.29 Cd. For 2007, Acura has made the TL slightly more formal than before with a larger grille, a new-style cluster for the high-intensity- discharge headlights, and a new front fascia element that now incorporates the foglights. There’s also more chrome trim. New mirrors incorporate turn-signal lights. The 2007 TL Type-S, meanwhile, looks more aggressive thanks to a unique front fascia, additional bits of aerodynamic trim, four exhaust tips peaking out from the rear bumper, and trim in black chrome. Overall dimensions lie between the rear-wheel-drive Infiniti G35 and the all-wheel-drive Audi A6. Although it has a wheelbase that’s a couple inches shorter than either, the TL offers 97.9 cubic feet of interior passenger volume. It has much the same measurements in front-seat leg- and head- and shoulder-room as its competition from Infiniti and Audi, yet the TL offers more legroom in the back seats. The TL’s 60-degree V6 engines are truly works of art. As you’d expect from Honda-derived engineering, they have a surprising number of features to maximize both power and efficiency. A relatively tall 11:1 compression ratio helps deliver crisp throttle response, while forged connecting rods and a forged crankshaft add strength and durability. The SOHC cylinder head has four valves for each cylinder, and variable valve timing improves torque at low rpm without compromising horsepower at peak rpm. A drive-by-wire throttle control helps deliver both excellent throttle response and good fuel efficiency. In keeping with its aspirations as a sports sedan, the TL has a sophisticated suspension layout. Unlike most front-wheel-drive cars, its independent front suspension uses wishbone-style, upper- and lower control arms with coil-over gas-charged dampers, furnishing for optimum geometry for wheel control and heightened sensitivity to bumps. The five-link independent rear suspension has special geometry to improve stability under braking, a worthwhile measure in a nose-heavy, front-wheel-drive car like this one. The standard TL has large, 300-mm front disc brakes with single-piston calipers, while the type-S gets additional stopping power from 310-mm front discs with Brembo-built four-piston calipers. In addition, the S-Type also has special steering hardware to improve on-center feel, increase steering effort at high speed, and damp bumpy road inputs. Bridgestone 235/45R-17 all-season tries are specified for the standard TL. When the TL is ordered with the optional navigation system upgraded Michelin tires are specified. These Michelin tires are also standard equipment for the TL S-type, while high-performance 235/45R-17 Bridgestone Potenza RE-030 tires are available. Acura also continues to offer its high-performance A-Spec suspension kit for the TL, which maximizes road performance with special dampers and springs that lower the ride height an inch, big 18-inch wheels with 235/40ZR-18 Yokohama AVS ES100 tires, high-performance brake pads, and a kit of aerodynamic trim pieces. In keeping with Acura’s heritage of functional Japanese efficiency, the TL’s interior emphasizes practicality and useful features rather than sumptuous luxury. At the same time, a sure sense of graceful design and the use of impeccable materials make the TL’s cabin appealing. The TL’s interior has a clean, spare look, and its open, uncluttered feel makes this a relaxing place to spend your travel time. Leather upholstery is standard, and it meets a high standard of quality, though it’s a little firm and cold. The interior of the standard TL mixes leather, aluminum brightwork and wood trim in an effectively sophisticated presentation, while the TL S-type incorporates carbon fiber in place of wood. Acura puts a lot of emphasis on human-factor engineering, and the TL’s interior has a special goodness as a result. The driving position gives you a commanding view, with the extraordinary panoramic visibility that is the hallmark of Honda engineering. The thick rim of the tilt/telescope-adjustable steering wheel fills your hand, while the switch gear is easy to find and simple to understand. Anyone can take the driving position in the TL and feel immediately at home. An eight-way power-adjustable driver’s seat is standard, as is a four-way power-adjustable passenger seat. The configuration of the front seats is inspired by the best high-performance designs, with supportive hip bolsters and an elaborately shaped seat back that supports your back and shoulders without being constrictive, plus new high-damping foam cushions. The rear seat is comfortable, although it’s clear that Acura has provided a fairly short seat squab as a means of getting a lengthy measurement of legroom. The instrument binnacle is protected from glare by a pronounced hood over three instrument pods, and the back-lit LED read-outs against new spun-metal faces are easy to see. The instruments of the standard TL use blue ambient lighting, while those of the S-Type feature red light. Aside from instrument lighting, the S-Type’s interior is detailed with lots of high-performance cues. These include carbon-fiber appearance rim, more prominent and supportive seat bolsters, stainless-steel pedal covers, and color-contrast stitching for the leather upholstery of the steering wheel, seats, and door panels. The Acura TL’s sophisticated ergonomics enable you to take advantage of its equally sophisticated electronic convenience features without confusion. The center stack between the two front seats uses switches, knobs and electronic buttons for the ventilation, audio and navigations systems in a way that prevents a nightmare of electronic confusion. Topmost in the center stack is the LCD screen that displays the climate control and audio settings as well as the optional navigation system. With the navigation system comes a line of PDA-like buttons and a central, cursor-style controller arrayed beneath the screen. Bracketing the screen are perpendicular rows of large, finger-friendly buttons for setting climate preferences for the dual-zone air-conditioning system. It’s also simple to adjust the interior temperature or change the force of the ventilation fan because the climate control can be operated by physical buttons instead of just the touch-screen inputs. oice-recognition system can recognize nearly 300 verbal commands, including adjustments to the audio and climate controls, and the DVD-based navigation system offers a selection of more than 7 million points of interest across the country. The navigation system supports Acura’s real-time traffic reporting feature, which provides the latest traffic reports from 44 cities across the nation. This system works exceptionally well, highlighting jammed roads in red, fast traffic in green. The audio system that comes standard includes everything you want in a premium setup, including a 225-watt amplifier, eight speakers, a six-disc CD changer, a cassette tape player, iPod capability and an AM/FM tuner that is set up to receive XM satellite radio. Most important is the system’s DVD-audio capability integrated with ELS 5.1 surround sound. DVD audio incorporates more than 500 times more audio information than a standard CD, and effectively delivers six-channel sound instead of conventional two-channel audio. We found the sound to be breathtakingly rich, not just loud. Acura has also specially engineered the TL with thicker glass and substantial acoustic insulation to help you get a home-quality audio experience in an automotive environment. Bluetooth technology is built right into the TL. In fact, the Acura TL was the first car to incorporate a telephone with Bluetooth-enabled, cell-phone compatibility. The system offers a hands-free, wireless telephone interface to reduce distraction. Acura has long been the leading automotive innovator with Bluetooth. For 2007, it can integrate the user’s mobile phone book, which provides an alternate to the voice recognition system. Interior storage is abundant. There are slim storage slots integrated into the back of the front seats as well as map pockets mounted in the front doors, although don’t hold as much as you’d expect. The center console is a deep, bi-level affair, with a power point in the lower level and a notch in the upper tray to accommodate a cell phone cord. Trunk space is just 12.5 cubic feet, and the opening is somewhat small, further limiting the size of parcels it will accept. The Acura TL is clearly a car for people who like to drive. Its confident, alert composure on the road not only makes driving enjoyable but also makes you a better driver. Compared to most of its rivals, the TL feels lightweight and responsive. The TL’s front-wheel-drive configuration provides a dimension of all-weather capability, while effective engineering has made it compatible with a commanding level of horsepower. It’s no surprise that the V6 engine dominates the TL’s personality. It has a sharp, mechanical edge to its performance, and it accelerates quickly to its 6250 rpm power peak, more like a small engine than a large one. At the same time, this V6 has enough power at moderate rpm to deliver soothing performance at modest speed. This combination of power on the open road and flexibility in urban traffic is a hallmark of Acura’s way of doing things. The TL comes with a 24-valve, SOHC, 3.2-liter V6, rated at 258 hp at 6200 rpm. A number of key features enhance this engine’s all-around performance, and it has a broad torque curve that peaks at 233 pound-feet @ 5000 rpm. An all-new five-speed automatic transmission for the 2007 TL is derived from that in the RL sedan, and it has a manual-shifting feature with a console-mounted lever. When this transmission is matched with the Type-S, shift paddles are mounted on the steering wheel. The S-type R is also available with a six-speed manual transmission, and it’s matched with a limited-slip differential for improved traction. The addition of the high-performance TL Type-S to the model line has enabled Acura to relax the standard model’s chassis calibration significantly with notably softer springs, dampers and suspension bushings. The standard Acura TL is now more comfortable and easy-going. The five-speed automatic offers a sequential, manual-shift mode for high-performance driving, but it’s likely that most drivers will leave it in Drive and forget about the rest. (That’s what we do most of the time.) Meanwhile, the standard 235/45WR17 all-season tires furnish a reassuring amount of cornering grip, yet also improve ride quality, as this car tends to transmit a bit more road noise to the interior than we’d prefer. The new TL Type-S incorporates the 24-valve, SOHC, 3.5-liter V6 already familiar to us in the luxury-oriented Acura RL sedan. Special tuning helps this V6 deliver 286 hp, and it also has special features to improve its torque output to 257 pound-feet @ 5000 rpm. The 3.5-liter V6 engine of the TL Type-S has only 11 percent more horsepower and 10 percent more torque than the 3.2-liter V6 of the standard TL, so it’s no surprise that personality of the two engines is virtually identical. The Type-S fun factor comes from a capable suspension calibration, with significantly less roll and far firmer damping than before, plus dramatically quicker steering response. The short-stroke brake pedal allows you to expertly modulate the large front disc brakes with their four-piston Brembo-calipers. Even on narrow, winding roads, this car rarely loses its composure, and the car feels evenly balanced on all four tires while the suspension rarely bottoms. Although the Type-S is available with a six-speed manual transmission, this choice makes it more likely that clumsy throttle inputs can upset the car’s balance, especially as the TL is distinctly nose heavy, with 61.4 percent of its weight resting on the front tires. The sequential-shift five-speed automatic, featuring shift paddles on the steering wheel, is a far more sensible choice for the Type-S. If ultimate performance fascinates you, then Acura’s optional A-SPEC package is a good choice, as the firmer suspension dampers and big 18-inch tires of the optional kit substantially increase the car’s cornering grip. With the chassis dynamics of the front-drive package under control, the six-speed manual transmission becomes a far more reasonable choice, and the standard limited-slip differential helps compensate for any clumsy throttle inputs, although you’ll still feel a wriggle of torque steer if you press on with too much enthusiasm. In this configuration, the TL even acquits itself well on a race track, something that few large, front-wheel-drive cars can claim. The Acura TL comes in two distinct models to deliver a mix of practicality and driving enjoyment to a broad range of drivers. The standard TL delivers style, safety, electronic convenience features in a package that offers the all-weather, town-and-country capability that most Americans prefer. It’s a great car. The Acura TL Type-S, on the other hand, is a real sports sedan, with power, performance, and sophisticated dynamics that enable it to match up against the finest European sedans. At the same time, the TL manages to deliver a measure of practical efficiency that distinguishes it among its competitors, a unique personality that relates well to the things that Americans want from a luxury car. Head/hip/leg room, f: 38.7/55.6/42.8 in. Head/hip/leg room, r: 37.2/53.8/34.9 in. Cargo volume: 12.3 cu. ft.